Now you see the motorcycle…now you don’t! I looked up “illusion” — impression, magic, deception, trickery. Hmm. The definitions for “magic” include enchantment, dreamlike, thrilling … I’m going with magic! When you see (and then you don’t see!!) — you will be totally enthralled as Reza presents one fantastic feat after another. His show is fast-paced, astonishing from beginning to end. There are the “large” illusions, of course. A disappearing motorcycle. A helicopter appearing out of nowhere. Reza gets himself sawed in half. (Most magicians save that for an unsuspecting audience member!) But just as amazing, in my opinion, are the times when he asks several audience members to pick and remember a playing card, think of a favorite candy bar … then how does it happen that he’s known and recorded ahead of time what they are? Or what colors someone will use for a painting? Where did that helicopter come from?! Before Reza takes the stage, Ziggy, Artist of Oddities, gets you prepared to expect the unexpected. While he’s eating fire (You heard right! ), Ziggy says, you won’t wonder, “How,” you’ll wonder, “Why? !” You’ll also see videos of Reza’s guest appearances on notable television shows like Duck Dynasty, Penn & Teller (Impressive! ), PBS, and Sherlock, the hit CBS television show. When Reza was six, a magician came to his school in Brooking, SD. Reza was called up onto the stage to help with the steel rings allusion. At home later that day, Reza told his parents he wanted to be a magician, and seeing magic shows on a family trip to Branson confirmed his desire! During his show, Reza asks a six year-old from the audience to help with the steel rings. Paying it forward? Reza thinks about youngsters and the future of magic. A year or so ago, he did a contest for aspiring young magicians. This year Caleb Alexander, the winner, takes the stage with an amazing “trick.” I don’t want to spoil your surprise, so I won’t give it away. His sleight of hand with the playing cards is also excellent! Reza’s skill, staging, and presentation are remarkable. But it’s hard to describe his show without giving everything away. The photos do it better! Looking around, the sold-out crowd was totally captivated throughout the show. You will be, too! 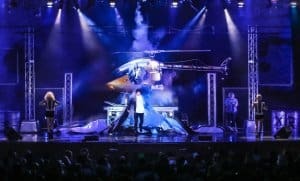 Enjoy Reza ~ Edge of Illusions at Branson’s Famous Theatre!